We told you last month that Sony had decided to expand the Amazing Spider-Man cinematic universe, and now we know which films they’ll be working on first. Two films are currently in the pipeline, based on some of Spidey’s villains: Venom and Sinister Six. Venom is set to be written by Alex Kurtzman, Robert Orci, and Ed Solomon, three of the writers overseeing the expansion of the franchise. Sinister Six, featuring the team-up of several notorious villains, will be written by Drew Goddard, who will also be handling Marvel’s new Daredevil television show on Netflix. 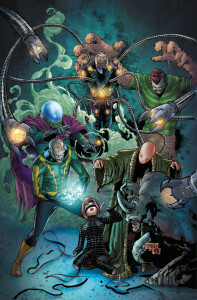 With the numerous villains due to show up in The Amazing Spider-Man 2, fans online have been speculating about a version of the Sinister Six possibly popping up in the films, and now everyone will be sure to watch the next movie for any sort of hints at what the spinoff will be about. The Amazing Spider-Man 2 will be released in theaters April 18, 2014 in the UK and May 2 in the US, with a third film due out in 2016 and the spinoffs yet to be scheduled. What do you think about the new spinoffs? Which character do you want to see on screen next? Let us know in the comments below!